Do you have what it takes to survive in the untamed lawless lands of the Wild West? Click here to play! Find out by spinning the reels on this 3D online slot game. You’ll have to mingle a whole cast of characters to survive in this small western settlement. Though, the more friends you make, the better off you’ll be. The banker is at the top of the list as this portly gentleman holds the top payout of the game. Spin two or more of his symbol across an active payline to pick up the progressive jackpot. You’ll also want to befriend the Shaman as his wisdom is endless and he offers a top payout of 3,000 times your line bet. He is also a scatter symbol that will trigger a number of free spins if you can collect two or more anywhere on the board. There are also sheriffs, robbers, Native Americans, jailbirds, and cowboys to name a few. There are also three bonus games available in this online slot. Each one is triggered when you collect the requisite number of specific characters. For example, collect four Native Americans on the paylines to trigger the Indian’s Gold bonus round. 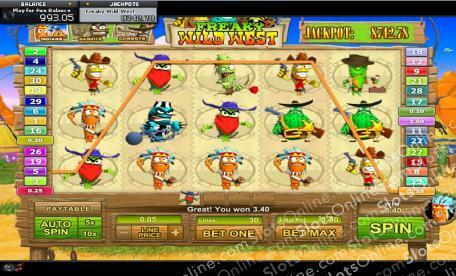 Spin the reels to find out if you have what it takes to settle the Wild West in this freaky online slot game. The Shaman is a scatter symbol. Spin two or more anywhere on the board to trigger a number of free spins. He will also payout up to 3,000 times your line bet if you can spin two to five across an active payline. There are three bonus games in this online slot. Each one is triggered when you collect the required number of characters on the board. Any four symbols will trigger the Indian's Gold bonus round where the Shaman will help you make selections to reveal bonus prizes. Any six symbols will trigger the Safe Crackers bonus game where you will be blowing up safes to collect your cash. Finally, collect any eight symbols to play the Shoot for your Loot bonus game in which you'll be shooting targets to reveal bonus prizes.